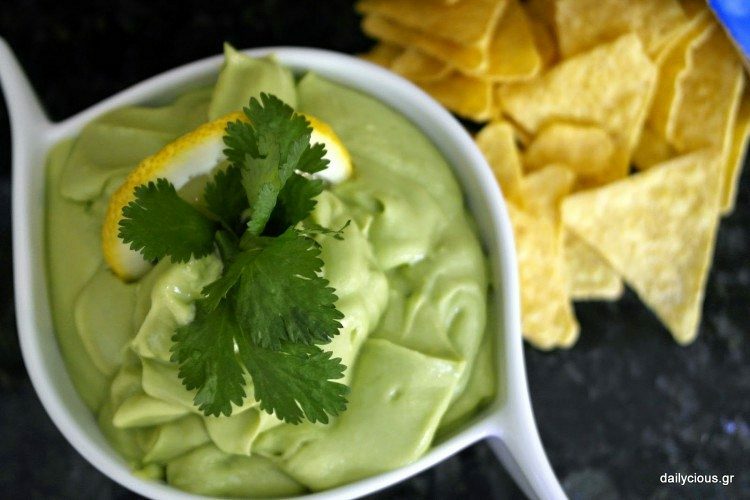 A wonderfully exotic and refreshing dip made with ripe avocados, lime juice, grated lemon rind and a little bit of tabasco for added spiciness. The dip takes only a few minutes to get prepared but needs to stay in the refrigerator for at least 8 hours before serving as it enhances the taste and helps the flavors to blend. Cut the avocado in half and remove the seed. Scoop out the inner flesh of the avocado with a spoon, separating it from the outer skin. Place the avocado pulp into the blender and add the rest of the ingredients except the cilantro. Blend well for 2-3 minutes until the dip becomes creamy and smooth (unlike the guacamole the avocado dip should not be chunky). Taste the dip and adjust to your taste. When the dip is ready transfer it into a bowl. Place a plastic wrap on the surface to cover it and prevent air reaching (which causes oxidation and could turn avocados brown). Garnish with the chopped cilantro leaves. Serve with tortilla chips (choose gluten free) and enjoy your creamy avocado dip! 2 tbsp cilantro (leaves and tender stems), finely chopped.